Jackie is Controller for Galapagos Partners, L.P. Previously she was a Senior Accountant for Photronics Inc., a public semiconductor manufacturing company in CT. 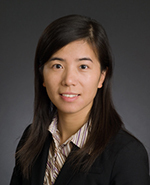 Prior to Photronics, Jackie worked as an auditor for PricewaterhouseCoopers, Shanghai branch. Jackie received her bachelor’s degree in International Accounting from Shanghai University of Finance & Economics. She is a CPA licensed in Texas. Jackie lives in the Houston area with her husband and her son.